Dillian Whyte vs Dereck Chisora Predictions and Betting Tips in a bitter domestic heavyweight showdown at the O2 in London and shown live on Sky Sports Box Office & DAZN. With the first clash between the two English heavyweights going down as a contender for the 2016 fight of the year, the rematch between the pair promises to be an enthralling event. Dillian Whyte (24-1), now 30-years-old, has since beaten Malcolm Tann, Robert Helenius, Lucas Browne and Joseph Parker to place himself into world title contention, and if a fight fails to materialize between Anthony Joshua and Deontay Wilder, then Whyte is in pole position for a chance to avenge his loss against Joshua from back in 2015. The ‘Body Snatcher’ produced a career best knock out performance against an out of sorts Lucas Browne and he proved his credentials with a points win over Joseph Parker. However, that fight possibly asked more questions than it answered as Whyte was rocked in the last round and was thankful the belt came when it did or it may have resulted in a win for the New Zealander. 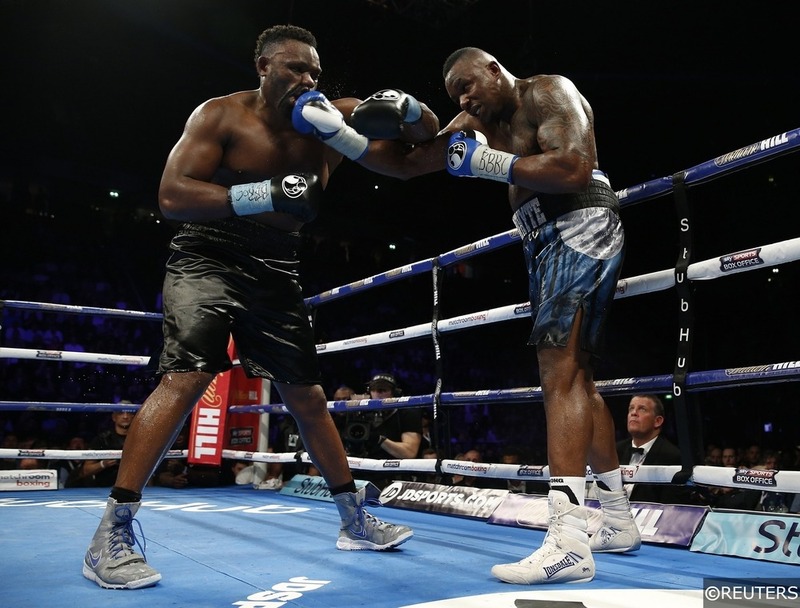 A tight, split decision saw Dereck Chisora (29-8) as the defeated fighter in the last clash between the pair, with many thinking ‘Del-Boy’ had done enough to get the decision. It has been a frustrating road since that fight for the 34-years-old with wins in ‘keep busy’ fights against Robert Filipovic and Zakaria Azzouzi either side of an unsuccessful challenge for the EBU European Heavyweight title against Agit Kabayel. However, he returned to form in impressive fashion last time out as he produced one of the performances of his career to stop Carlos Takam. The last fight between these two produced a spectacular affair and was one of the best fights the heavyweight division has seen in a long time. In a close contest, it was left for the judges to settle it and although they sided with Whyte, there is plenty who disagreed. Since then, Whyte has had some good wins but his last fight left people questioning his levels of stamina. Chisora, on the other hand, comes into this fight on the back of an excellent win, but truth be told he shipped a lot of punishment in that fight and has always blown hot and cold throughout his career. It is an old stigma in boxing that the winner of the first fight usually goes on to record a more emphatic win in the rematch, and that is precisely the way we expect things to go in this one. With a full camp for Whyte this time, he should have no problems with his fitness and given that his foe has plenty of miles on the clock, you have to wonder what is left in Del-Boy’s the tank. We think that backing Whyte to win by stoppage is the way to go as the Body Snatcher goes on to look for that elusive world title fight. Cristofer Rosales vs Charlie Edwards predictions and betting tips as Rosales defends his WBC World Flyweight title against Epsom’s talented boxer, Charlie Edwards, on the undercard of Dillian Whyte vs Dereck Chisora. Cristofer Rosales (28-3) stopped previously undefeated Paddy Barnes in Belfast back in August after the pair had slugged out in the middle of the ring, before Barnes was unable to recover from a brutal body shot from the Nicaraguan. It was the first defence of the title which was won against another previously undefeated fighter, Daigo Higa, but Rosales has form for coming out second best against English opposition. The Nicaraguan has three defeats on his record, one which came early in his career but the other two have come against high level English fighters in Andrew Selby and Kal Yafai. Charlie Edwards may only be 25-years-old, but he is already on to his second attempt at winning world honours as he was previously stopped in the 10th round of his first world-title bout against John Riel Casimero in 2016. Many criticised the matchmaking for the highly rated prospect at the time but since that contest he has gone on to rebuild his career with five straight wins, claiming two titles – British and WBA Continental super-flyweight – in the process. At 24-years-old it perhaps should be expected that Christofer Rosales has improved in almost every fight he has been a part of. He looks big for the weight, is strong and is a very good fighter up close. However, whilst he is undoubtedly a big puncher 19 of his 28 wins coming by way of knockout, he always seems to struggle with elusive type boxers. In his last contest against Paddy Barnes, the Irishman seemed to be out-boxing him before being stopped with a devastating punch to the body. If there is a fighter you can describe as box and move, then it is Charlie Edwards. His movement is exceptional, he has a sharp jab and great left hook. If he is to come out on top then he will no doubt have to prove he has the heart to stay in there, but the fact that he took some big shots from Casimero in his first World title fight will have served him well, and although he was eventually stopped, he can probably put that down to being stepped up too quickly. Charlie Edwards to win by decision. Joshua Buatsi vs Renold Quinlan predictions and betting tips as the undefeated Brit defends his WBA Light-Heavyweight International belt against former the IBO world champion live on Sky Sports Box Office. With Buatsi rated as one of the hottest prospects in world boxing, it remains to be seen if he has the skills to go through the levels and get as high as most people expect. Joshua Buatsi (8-0) has won all eight professional fights and knows a win over his Australian foe will move him up the rankings and could lead to major honours in 2019. It is clear Buatsi is highly regarded as he is the protege of Heavyweight sensation Anthony Joshua and in his early pro fights, he certainly looks like every bit of the talent most people believe him to be. Buatsi won the WBA Light-Heavyweight International belt in spectacular fashion when he destroyed Andrejs Pokumeiko inside one round at The O2 in July before blitzing Frenchman Tony Averlant in the opening round at the Metro Radio Arena in Newcastle in September. Renold Quinlan (12-3) is travelling from New South Wales, Australia and he has already managed to earn world honours by winning the lesser recognised IBO title at super-middleweight. It is not the first time Quinlan has made the trip to fight in the UK as he extended Chris Eubank Jr into the 10th round before suffering a stoppage loss in February 2017. A win over fellow Australian and former world title holder Daniel Geale is undoubtedly the best name on his record, but a loss to Damien Hooper last time out was another blow to any hopes he had left at competing at the top level. Although Joshua Buatsi was only good enough to win the bronze medal at the 2016 Rio Olympics, his switch to the professional ranks seems to have done him the world of good. Buatsi has stopped six of his eight foes so far and the two that did manage to go the distance with the 25-years-old did so in a contest which went four rounds less than the what this weekend’s fight is scheduled. Putting the victory over Geale to one side, it is clear that Quinlan has come up short pretty much every time he has stepped up in quality. When you also add to the fact that the majority of contests have come at a lower weight and he is facing off against a fighter who has already developed a reputation of being a fantastic finisher, then it seems as though the chances of an upset look very slim. Fight to last less than 6.5 Rounds. Team Tag: Dereck Chisora and Dillian Whyte. Type of Bet: Tournament Preview. Sports: Boxing.